More than most organizations, enterprise businesses need to maintain a scalable and reliable web presence to remain competitive. To that end, many IT leaders of large-scale organizations have historically looked to expensive web solutions requiring proprietary support contracts to guarantee quality. There is another way, though. Over a decade into its existence and now powering 33% of the web, WordPress is steadily becoming a solution that demands attention from even the largest of firms. In this article, we’ll cover the specific needs of larger organizations, talk to experts in the field about the platform, and look at the many reasons why WordPress is a perfect fit for your enterprise business. We’ll also touch on competitors and myths about the platform as we go. Let’s start with some brief definitions and background. What Do Enterprises Know About WordPress? “Enterprise” itself is obviously a generic term but when applied in the context of a particular type of business it generally means a large, usually multinational organization. These outfits will typically be comprised of individual organizational units with their own budgets and objectives. People’s precise definitions of what constitutes an enterprise business vary considerably but, as it relates to web technology, an enterprise website will usually require the ability to handle significant traffic throughput – especially if it’s a media site. It’s also often the case that enterprise sites will have to accommodate localization, multilingual content, and many smaller microsites. Enterprise solutions also often arrive with complex access requirements which include the need for clearly defined roles and permissions. As the world’s most popular CMS with over ten years active development behind it (and the spawning of a billion dollar company in the form of Automattic), WordPress is more than mature enough to handle these requirements. We’ve covered WordPress’ history in depth here before at Kinsta so we won’t retrace our steps in that department. A quick look at the blue-chip enterprise clients served by both WordPress.com and WordPress.org should be enough to establish the platform’s current credentials in that space though. Kevin Ohashi is a well-known consultant in Washington DC. As a consultant, he works with clients to design, architect, and build websites and software applications. He also runs the popular web hosting review site ReviewSignal. We asked him what enterprise clients know about WordPress. Q: Whenever an enterprise client asks your opinion about CMS options, what do they ask the most frequently? What are their priorities? The biggest questions I face are: can it do what I want it to do? What will it cost? Why should we use X over Y or Z? The biggest concern is always the deliverable and cost though. Only if they’ve used something in the past or heard about someone using something else does question three ever come up. This is also up to the consultant to shape the conversation. A good consultant’s goal is to convince the client they can deliver something of value to them. The underlying technology used to get them to their goal almost doesn’t matter. I pitch them the tool I think best fits their needs. Q: When WordPress comes into question for enterprises as a possible CMS solution, what are the first reactions? What do they know about WordPress and are they willing to choose WordPress for their projects? I think just about everyone has heard of WordPress at this point. I rarely need to introduce it anymore. The reactions generally fall into the categories of “I’ve heard of it”, “I’ve used it before”, and “I didn’t like it”. If they’ve used it before and liked it, it’s mentioned beforehand and generally they want to keep using it. I don’t find that most clients have much opinion on the CMS, it’s really up to the consultant to help them understand what might be a good solution to their problem. Q: In which aspects do you think WordPress should be improved to be more appealing for the enterprise sector? I think the consultants who cater to enterprise clients need to be convinced. Ultimately, they are often the people making the recommendations and decisions on behalf of clients. There is also still a lingering impression that WordPress is just for blogs. I’m really not sure how to change that perception though. Even with its astonishing success, WordPress is far from the only CMS solution available for companies to consider. 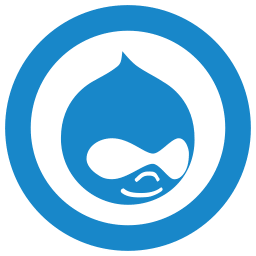 The two most popular open source alternatives are Joomla and Drupal and, of the two, Drupal would have been traditionally viewed as the superior candidate for enterprises. Is that still the case, however? Though Drupal has powered impressively large sites such as The Economist, the last few years have not been great for the platform. Also, according to W3Techs, as of March 2017, WordPress holds around a 59% of the CMS market share. Unfortunately, misconceptions about WordPress have long abounded and many of them unnecessarily damage the case for its suitability as an enterprise solution. Most of these myths are based on older versions of the software when its overall level of polish and functionality was a long way from what’s on offer today. Let’s get a few of the more obvious ones out of the way before we go any further. WordPress is justifiably proud of its roots in the world of blogging and the stated aim of the platform – to democratize publishing – looks to build firmly on those beginnings. It’s an aspect of WordPress’ history that has led some larger outfits to dismiss the platform as little more than a souped-up blogging engine – a position that’s very far from the case these days. 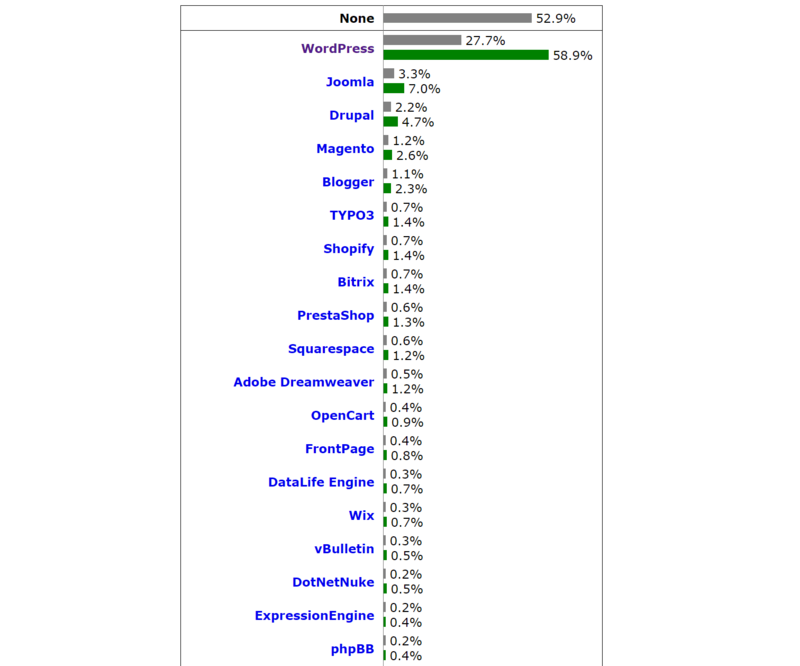 WordPress is currently powering over 29.3% of all website. The days of it being primarily a blogging solution are a long way in the rear-view mirror at this stage. Another myth about WordPress is that its security track record is poor. WordPress has certainly suffered some less than stellar years in that respect – 2009 was a particularly low point – but its recent track record is solid, especially considering the size of target that it represents. Best practice steps for locking down the platform are commonly known, security releases are prioritized and speedy, and the WordPress Security Team now comprises 25 experts including lead developers and security researchers. Third-party themes and plugins remain a possible attack vector, but the core software has never been safer. For more tips on how to secure your WordPress site please check our in-depth guide on the topic: The Ultimate Guide on WordPress Security. Our final myth about WordPress will shock many but it’s still an unfortunate reality in some sectors of the corporate world – the idea that open source software cannot be relied on at the enterprise level. In 2015, this is really an argument that should long ago have been settled but you will still see it surface from time to time. In addition to powering the vast majority of the web, Linux is also steadily increasing its grip on the enterprise space. Massive firms such as Facebook and Google also have open source at the absolute heart of their technology stacks. WordPress’ status as an open source project really shouldn’t be an issue and its commitment to the GPL is a huge plus, not a minus. 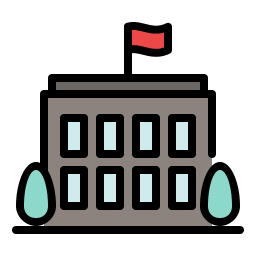 It’s been precisely this rock solid open source underpinning that’s enabled the software to flourish while giving thousands of businesses a solid platform to provide services around. 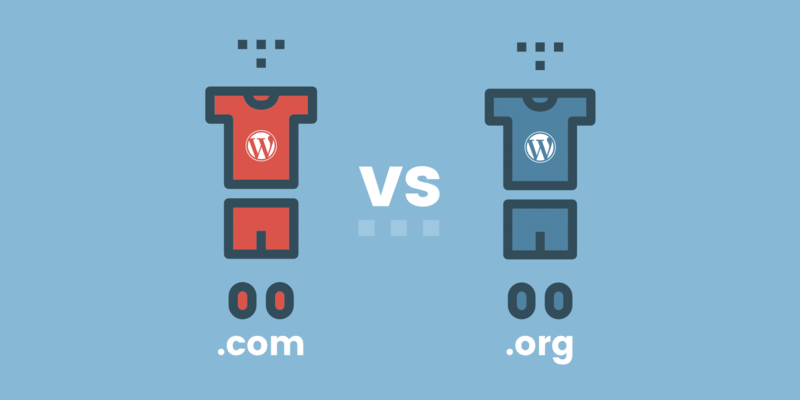 We’ve covered some of the myths standing in the way of the adoption of WordPress by enterprise firms, but there is also a very solid list of technical reasons that make it an excellent candidate for outfits at any scale. Let’s step through the main ones. WordPress’ early decision to make the platform extensible via plugins is at the heart of much of its success. It’s enabled the core team to keep the bulk of the platform relatively streamlined while opening the door for entirely new industries to emerge by satisfying consumer demand in the form of dedicated plugins. This is good news for enterprise administrators as they have complete control over what gets added to the base platform on their own installs – in addition to an easily understood framework for creating their own custom code if necessary. This allows small internal teams to move quickly in terms of prototyping and actual deployment. In a world that is well over the edge of the mobile tipping point, native support for responsive design is simply a must these days. WordPress’ admin and default themes are responsive by default and front-end developers can choose to either base their designs on any of the many responsive front-end theming frameworks available for WordPress or roll their own solutions. Another key technical selling point for WordPress is that it’s scalable. WordPress is built with core web technologies that have proven themselves over the years and are understood at scale. Whether it’s in terms of database tuning, web server optimization, or advanced caching strategies, WordPress sits in the middle of a generally understood stack so developers will not need to reinvent the wheel when operating at enterprise scale. The success of companies such as Automattic and Incsub shows that the platform can handle pretty much anything you can throw at it when dialed in correctly. Another technical advantage to WordPress is that it’s SEO-friendly out of the box. While you may need to install a plugin to make handling on-page SEO a little easier (the Yoast SEO plugin and All-In-One SEO Pack are two popular solutions that spring to mind), WordPress naturally functions well in this regard. In the context of enterprise sites with potentially massive amounts of content, this is a major selling point. Another great benefit of WordPress is that it’s constantly updated. WordPress has been updated 20 times this year — an average of almost two updates per month. WordPress has supported multiple sites since version 3.0. Enterprise users are free to handle complex requirements from a single WordPress installation meaning there’s less overhead in terms of time and server resources. Multilingual solutions can also be easily enabled and specialized plugins such as WPML exist to handle every aspect of translating and deploying content. Check out this multilingual WordPress setup guide. The WordPress REST API has the potential to change the platform forever and is slowly making its way into the core of the software. When it finally lands, the REST API will enable developers to programmatically interact with the software in a completely new way. To cut a long story short, WordPress is increasingly an application framework that’s ready for enterprise use. Another great feature about WordPress is that its open source nature doesn’t tie enterprise adopters into hard to customize, black box solutions that are expensive to upgrade and force you to work with just one vendor. Enterprise clients have a wide variety of solutions providers to choose from. One of the main selling points of WordPress over time has always been the friendliness of its admin interface. Navigation around the WordPress backend is intuitive, even to novices. All of this is a big selling point both in the context of internal users (not all of whom may be technical) and pitching the software to enterprise clients. WordPress allows administrators to set varying levels of access for users via an easily extensible user roles and capabilities system. IT teams can make use of WordPress’ predefined roles to cover many common use cases and have the option of extending them at any time in order to handle custom requirements. To get more insights why WordPress is a good choice for enterprises, we asked Peter Slutsky – the Director of Platform Services at Automattic and WordPress.com VIP – about the present state of WordPress on the enterprise level. 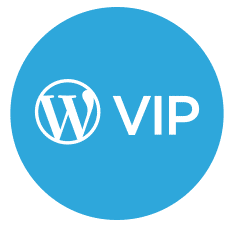 A slew of high-traffic, enterprise websites are hosted at WordPress.com VIP and they receive a ton of feedback from their clients so we decided to find out a little more. Q: What is the present state of WordPress on the enterprise level? For the first couple years of WordPress, it was seen only as a blogging platform and it became prominent because of that application. However, WordPress has shifted and has made great strides over the past few years and now a wide majority of users are using WordPress as a full CMS, rather than just a blog. 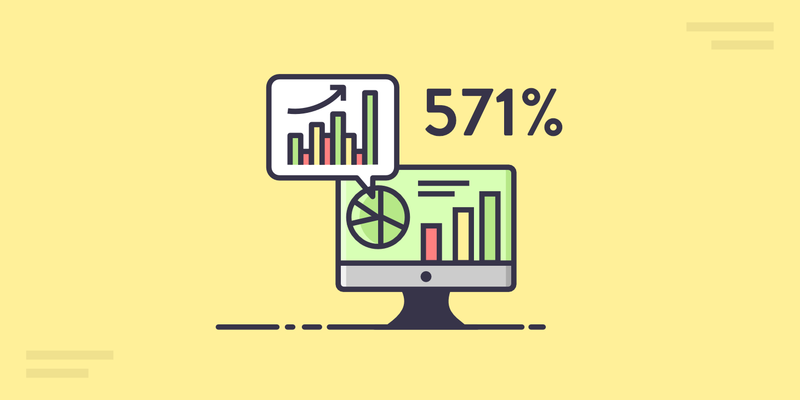 Today, WordPress powers 26.6% of the internet and of that 26.6%, the majority of users are using WordPress as a full CMS. In that mix, there are many examples of enterprise-level sites across all major industries including media, finance, higher education, entertainment, politics, government – the list goes on and on. Q: What are the specific advantages of using WordPress for enterprise? There are many reasons why WordPress is such an attractive software solution in the enterprise space. WordPress is scaleable, flexible, affordable (in most cases, free! ), and open source. WordPress can power your mother’s cat blog or large pieces of the Mercedes-Benz, Sony Music, BBC America, The New Yorker, and Time websites. 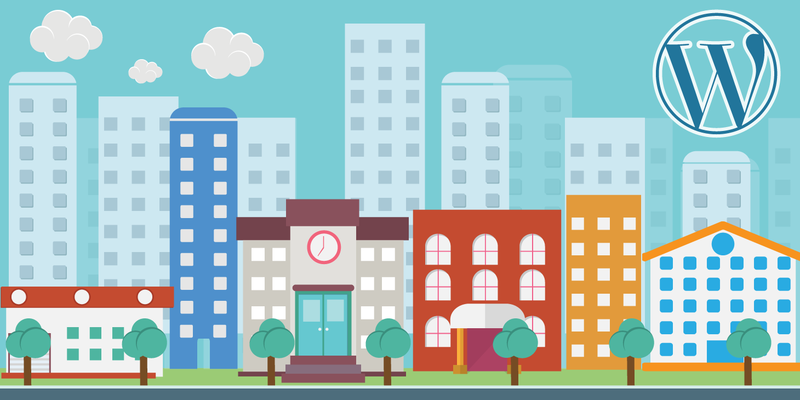 Check out our post on the top 130+ WordPress sites dominating the web. WordPress has iterative updates that don’t break previous versions – we call that backwards compatibility, which means that unlike, say, Drupal, you’re not having to rebuild a site from scratch in order to update the software. WordPress also offers thousands of plugins and themes and there is a huge ecosystem and developer/design community that surrounds WordPress, so you can always find great talent to work on your site wherever you are in the world. We’ve moved past the days of expensive proprietary software where companies and organizations are locked into pricey, long-term deals for content management systems that aren’t great. The future belongs to open source and, as the numbers show, WordPress is dominating that game in almost all areas. Q. More and more highly visited sites are running on WordPress. To mention one example of the many – The New Yorker has migrated to WordPress. What do you think the reason for that success is? The New York Times has actually used WordPress for a long time – they recently did some big updates and are using WordPress in some super creative ways – it’s been an exciting evolution to observe. Same thing goes for the Washington Post. While WordPress dominates the large media space, it’s exciting to see it also being leveraged in the rise of independent media. Sites like Nate Silver’s FiveThirtyEight and Re/code are also powered by WordPress. I have some insight into the product roadmap at Automattic and WordPress.com – along with WordPress.org – and all I can say is that there are some very exciting things coming that I think will help take WordPress from a software solution leveraged by 32% of the web, to a software solution that is used by a majority of the web over the coming years. Q: How do you see the future of WordPress on an enterprise level? As Oprah Winfrey once famously said, “when I look into the future, it’s so bright it burns my eyes.” Well, that’s kind of how I feel about the future of WordPress, especially in the enterprise and government space. As I mentioned above, I’ve seen the product roadmap and I know that my 400+ colleagues here at Automattic are working hard to ensure that longevity and usability of WordPress for many years into the future and it’s very exciting stuff coming down the pike. In the near future, we’re sure to see the slow demise of expensive, proprietary software and, in that transition, the rise of open source and WordPress. It’s exciting, the future is here! The list of brands mentioned by Slutsky is just the tip of the iceberg. The Huffington Post, Xerox, Harvard Business Review, TurboTax, and Spotify are just a few of the other high-profile outfits turning to WordPress as their CMS of choice these days. One of the many advantages WordPress offers enterprises is the community of users, developers, and supporting suppliers that the platform provides. Taken together, these form a valuable ecosystem of its own that enterprises can lean on for support. The platform is well optimized by default, but it still requires a specialized enterprise WordPress hosting environment to ensure optimal performance. Enterprise clients would have traditionally handled much of the heavy lifting here themselves, but the increasing popularity and power of managed WordPress hosting solutions make outsourcing a real option these days. Highly specialized server setups, caching layers, automated backups, and security arrangements are now the norm and world-class support gives enterprise clients the confidence to turn to third-party providers for managed WordPress hosting. Here at Kinsta, we have a Google Cloud and container technology powered infrastructure to serve high traffic websites and enterprise client needs. The last number of years have seen the emergence of a new breed of high-profile WordPress development agencies such as 10up, Westwerk and HumanMade who are all more than capable of handling enterprise clients. Q: Modern Tribe is a well-known web design and development agency. You create WordPress-based websites for big international companies. Why did you choose WordPress, what are the main advantages of this CMS? We had been using WordPress and other platforms for quite a few years and we simply found that we continued to gravitate towards using WordPress over all other platforms and content management tools. It was the most well-rounded, community-focused and community-driven platform that we had used. WordPress was focused on simple usability in the admin panel, making it an “easy win” for clients to pick up and understand. What WordPress really excelled at for us was being an affordable, excellent platform that didn’t come with all of the mess and complexity of custom CMS and enterprise-built solutions. Q: Many people know WordPress as a blogging platform, but it has become a lot more. Do you think it can stand its ground in the enterprise environment as well? Definitely. Ultimately, WordPress is a great core codebase for building amazing solutions for client problems. This is especially true within the enterprise environment; there are countless interactive needs of clients within the enterprise realm, and with WordPress we are able to start with a great platform and build on top of it from there. This saves the client time and money as well by not having to purchase an outrageously expensive server or license to use an “enterprise-only” CMS platform – something which can lock them into one path for years. We haven’t met a client that isn’t on board with that idea alone. WordPress legitimately has the power to accomplish what you need, you just need to open yourself to accomplishing things in open-source and with a community-driven mind. Q: What’s your opinion about the future of WordPress on an enterprise level? We feel that WordPress is the solution for enterprise level clients and projects. The platform has roughly 35.5% of the internet backing it already which shows that it’s dedicated to the internet and the many people using it. WordPress enables us to accomplish high-level projects more efficiently; thus saving enterprise level clients the extra money for being on proprietary CMS platforms or extremely expensive servers — a sincere win-win for all involved. I won’t be surprised to see the percentage of users on WordPress continue to grow, and the percentage of enterprise-level clients to grow by leaps within a few short years. Even if you’re not going down the agency route, it’s never been easier to find expert freelance WordPress developers. The last five years has also seen the emergence of a new breed of on-demand solution providers specializing in support and maintenance services such as WP Site Care and WP Buffs. We’re seeing more and more enterprises making the switch and wanted to close things out here with a real-life example. We asked Evonne Young – Associate Director of the Kaiser Family Foundation – why and how they moved to WordPress from a custom and outdated CMS. 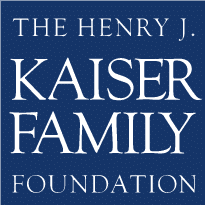 Q: The website of the Kaiser Family Foundation was migrated from an old platform to WordPress. When and why did you feel it was time for a change? Streamline the CMS and improve the ease and efficiency of posting. 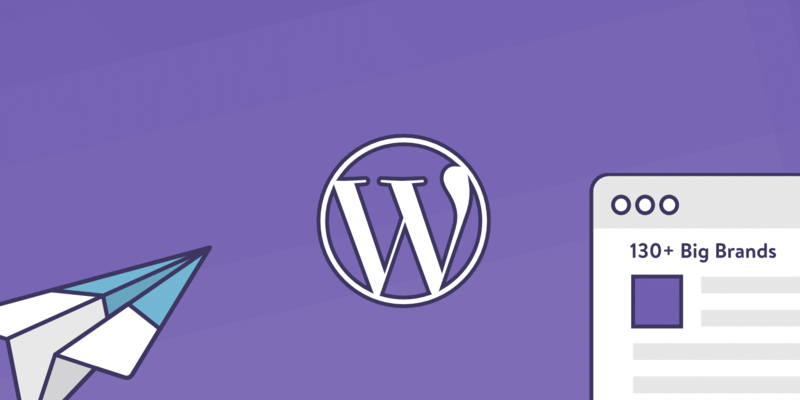 Q: Why did you choose WordPress over other CMS options? We considered Drupal, but we were concerned about ease of use and the costly, and labor-intensive, upgrades involved. We liked WordPress’ intuitive backend – easy for a policy or communications person to understand and update content. The ability to use plugins rather than building everything from scratch was also attractive and the open source environment allowed us the freedom to develop new features quickly and at a lower-cost. Q: Was it hard to migrate the site to WordPress? How long did it take? Yes, migration was a challenge. A primary goal of this project was to combine the many different systems running isolated sites on many different domains into one site running a single codebase. We pulled content from six different systems – I know our developer had to write a custom script and run the migration several times before we got it right! Q: Would you recommend WordPress for other similar highly visited sites? Yes, WordPress has proven that it’s not just a blogging platform. WordPress is at a fascinating point in its history. It’s long since outgrown its blogging roots (though it’s still an excellent blogging solution) and has quietly captured a staggering amount of overall online traffic. A number of factors are now converging that point to the enterprise is the next main driver in continued WordPress expansion. The platform has a solid run of exemplary recent releases behind it, the REST API around the corner, and an increasing number of satisfied enterprise users on board using both the commercial and community versions of the software. As the various insights shared by our interviews show, there’s never been a better time to consider it for your own enterprise needs. We’d love to hear your thoughts. Is WordPress on the shortlist for your next enterprise level upgrade? Get in touch via the comments and let us know! I apologize but Harvard Business Review, Washington Post and The Huffington Post are not using WP…where did you find this information? Oops, that was indeed out of date. Thanks for the heads up. I have updated with Mercedes-Benz, Sony Music, BBC America, The New Yorker, and Time websites.